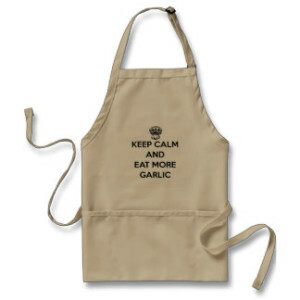 Garlic and human history have been closely intertwined over thousands of years. Evidence of the history of garlic stretches back for about 6,000-7,000 years (and possibly even further), making it one of the oldest known cultivated crops along with wheat, rye, and other crops. Garlic originated in Central Asia and made its way around the world following major trade routes, spreading first to India, Europe, and the Middle East and then to North and South America as the Conquistadors and other Europeans arrived. Garlic has been used medicinally and for culinary purposes for much of its history, with the Ancient Egyptians, Greeks, Babylonians, and other cultures making significant use of garlic. Garlic is mentioned in both the Bible and the Quran, revered as an aphrodisiac and reviled as a sign of Satan, savored for its smell and shunned for the inevitable garlic breath it produces. Anecdotal stories about the history of garlic abound, garlic cloves being found in the tomb of King Tut to tales of Roman athletes and soldiers using garlic in training to build strength to countless fables about vampires and their fear of the “stinking rose”. 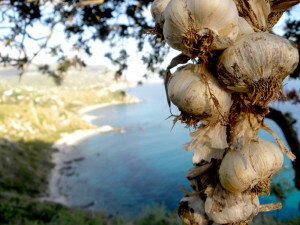 Garlic will grow in many different climates, helping it spread throughout the world. While many varieties of garlic will produce a stalk (called a scape) and flower and seed, it reproduces asexually from the cloves and has lost the ability to propagate naturally through its seeds. Genetically different varieties of garlic occur through random mutations, although some efforts of growing garlic from true seed have been successful, which raises the possibility of creating new hybrid garlics in the future. Garlic has been a popular item in the kitchen for many centuries but its reputation has waxed and waned, especially in the U.S. For much of the 20th century garlic was considered a working-class staple and not worthy of haute cuisine, but that has ceased to be true in recent years. Chefs have slowly woken up to the wide range of flavors available in different types of garlic and small farms and organic growers have enthusiastically embraced gourmet garlics. 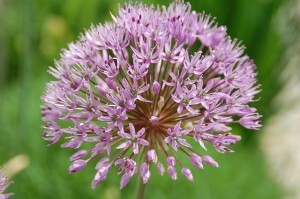 Specialty garlics can command high prices at farmers markets and garlic is a relatively easy crop to grow organically. It is naturally resistant to many pests and diseases and its aromatic nature keeps deer and other foragers at bay. The history of garlic has taken lots of twists and turns but it has both survived and thrived across thousands and thousands of years.